I am not an artist. Not in the typical sense of the word, at least. I've always been better with what you can work with in your hands than creating something out of thin air--in other words, I've never been able to draw very well. You only get better with practice, but for a long time, I didn't even like practicing because I was never able to make anything look like it did in my head, and since I could do it with fabric, why even bother putting it on paper first? But I had to sketch for an assignment for class (and it was only be the beginning of such assignments, I know). 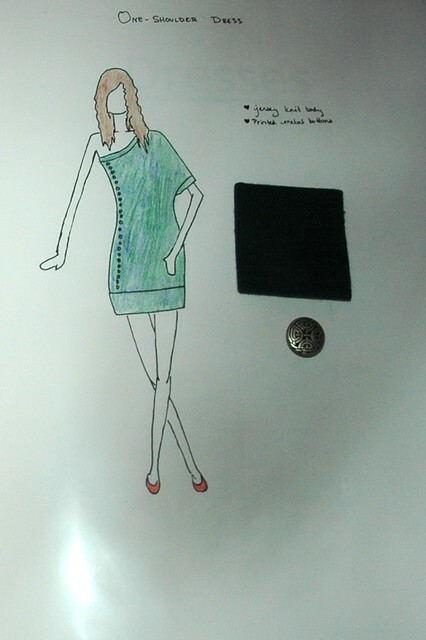 We were supposed to choose five design sections (I chose dresses, skirts, coats, sweaters, and necklines), and then choose elements from each section (sundresses, cocktail dresses, tube skirts, bubble skirts, peacoats, sweater dresses, aran sweaters, cowls, one-shouldered, etc. 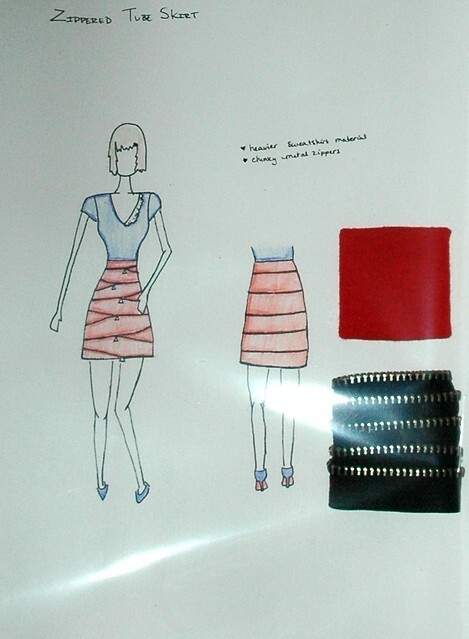 ), roughly sketch a design for every element from each section, do polished sketches of one garment in each section, and then put together a final look combining some of the polished sketches. In all, it came to 20-something sketches. 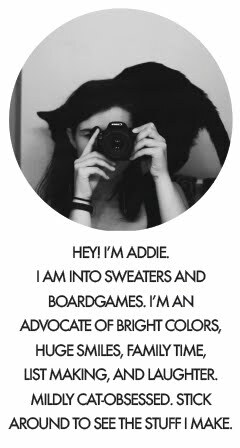 Because there was a lot of prep-work involved (putting together inspiration pages of photos and such) & I had massive amounts of other homework, and (let's be honest and get to the real reason) because I'm such a procrastinator, I put the actually designing off til the last minute. The night before it was due, I stayed up all night, listening to music and sketching and putting together swatch cards, eating french silk pie at 3AM for caffeine, and really enjoying the process. The most difficult part of it was, surprisingly, the actually designing. Some things were really easy for me to design, and for other categories I'd spend ages staring at the paper before I got ideas. Maybe if I hadn't left if off til the end it wouldn't have been so hard? I had never had to sit down and design so much, and such a range, all at once. So it was tough. This was one of my favorites. 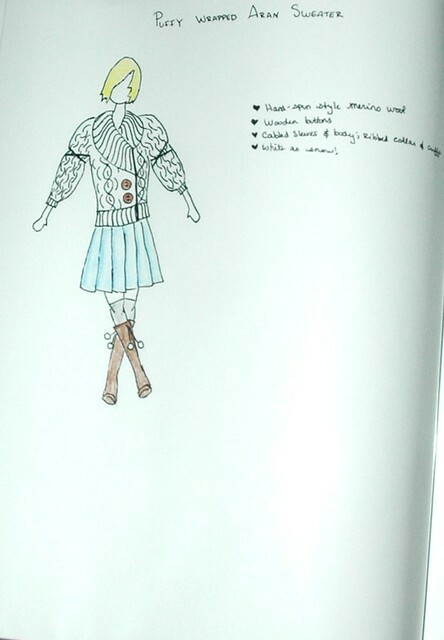 I was kicking myself at the time for choosing an Aran sweater as a category, thinking, "how am I going to design--and then draw!--knitting??" But I love how it turned out and absolutely would wear it. One of these days I'll scan my more recent sketches. I've been doing the technical flats along with the fashion sketches, & I'm much better at those--and my brain understands them better! oh cool!! 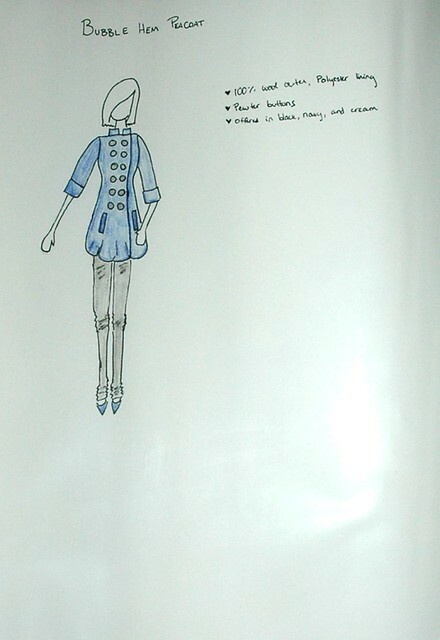 I've never tried fashion design drawing, perhaps I should give it a try. Your coursework really does sound awfully fun! I love your mitten hands! I've been sketching "fashion" since 8th grade, and I've never mastered faces or hands, so I always had to pose ppl with their hands hidden. I'm stealing your mitten hands! I still don't really draw faces tho. 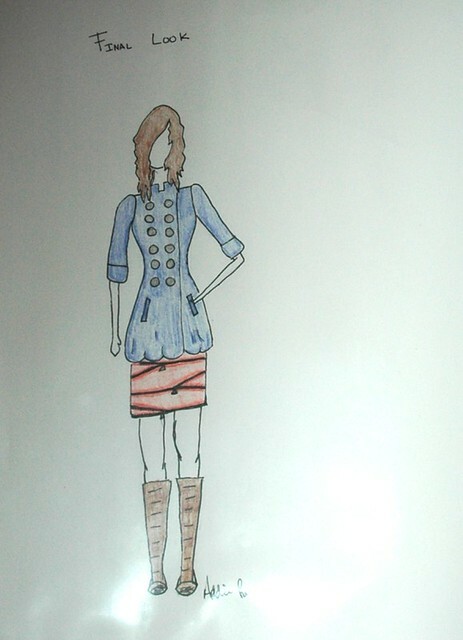 I love the pea coat! 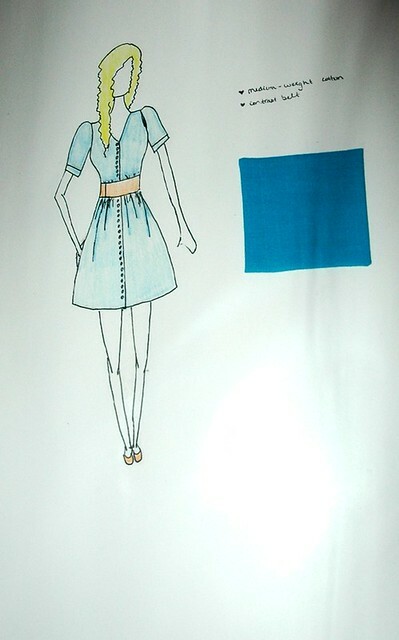 and that belted dress is too sweet. I really love the one shoulder dress. I can't draw either so I know your pain, but you did a really good job! I love it! You should keep posting your most recent sketches... I'd very much enjoy seeing what else you design. P.S. Thanks for your super sweet comment! Sketching is not my strong suit either...and I avoid it for the exact same reasons. Not being able to express what's in your head is frustrating. Props to you for sticking with it and continuing to practice. Oooh I likie your sketches Addie!! Specially the zipper mini! Sweeet! i love your work i'm a fashion freak to! My friends and i love to look at your work! When we were little we would play games such as dress up with just yard and a half fabric and we would try to peice it togther to make it look like french fashion.Now i'm her boss in fashion and she is the VP but we still do our same routen. She draws the i make clean ups ad sow! Anyways i LOVE the one sholder one to!!! !